What began as a practical solution to an ongoing problem enabled me to look into metaphors of healing, memory, mortality, labour and to the reciprocal relationships between humans and non-humans. Mending is an act I practice in my art and in my every day. Aside from the economic practicalities to do so, I mend out of empathy towards the garment, and a comfort to have delayed its ultimately fate in a landfill. I feel empathy towards the critical state of our environment where not only we humans suffer but also the animals and plants. I mend because the repaired objects are a tangible evidence of care. I mend because it is a noble act. Over time, I looked beyond clothing repair and more broadly at my role as a human being and an artist, I have become interested in the concept of repair in nature. Without dominance or harm, I am interested in creating absurd futile gestures and exhaustive acts of labour in order to create an experience that is palpable, absurd and meaningful. Relationships begin to develop and form with nature, yet the exchange of care does not truly benefit one party over the other, nor does it hinder. In my current project, Underneath the Canopy I plan to explore the complex and complicated relationship between humans and non-humans through gestures of healing and resilience. By challenging the notion of why we care, futile gestures and exhaustive acts of labour are performed. 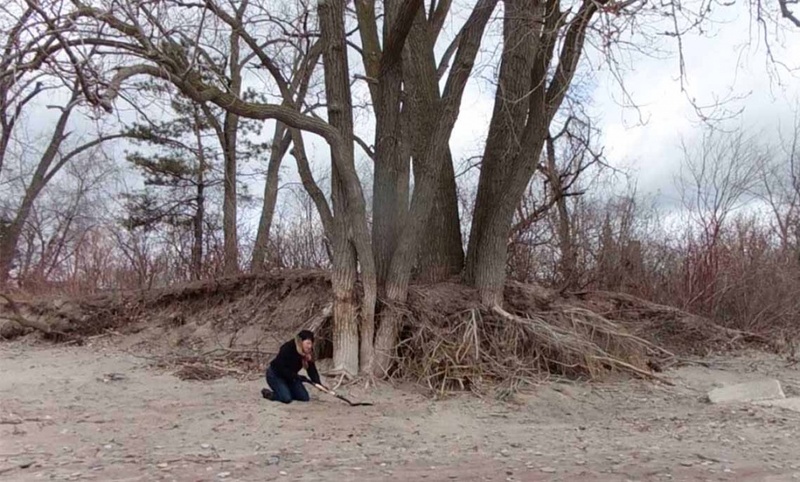 The project looks into the site of Gibraltar Point, Toronto Islands. As a durational piece, I am interested in seeing how my relationship will evolve as the islands have been reopened to the public again. I plan to explore the futile ways of tending to the site and how these gestures will co-mingle with the site itself, with the visitors to the island and with the non-humans species such as the trees. My hope for this residency and for my project is to continue to weave in notions of mending and consequence, memory and loss, resilience and hope. Stéphanie Cloutier is a Toronto-born French Canadian artist and writer whose practice is based in textiles, installation, photography, performance and video. Her work considers the notion of mending and other haptic processes as an act of resistance, collective memory and labour. She is currently completing her BFA in Sculpture and Installation with a minor in Material Arts and Design-Fibre at OCAD University. Recent exhibitions include Resilient Attitudes at Beaver Hall, Toronto (2018), and Hard Twist 13: Threads at the Gladstone Hotel (2018).